New year's Viennese ball is a wonderful European tradition that Ukrainians are happy to have adopted from Western neighbors. 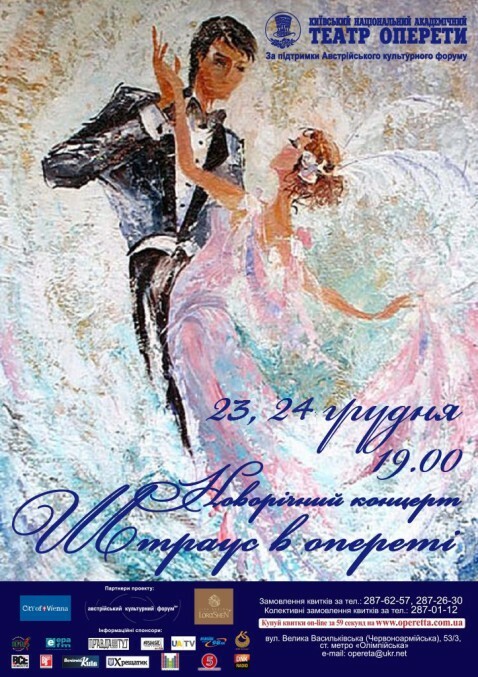 Once again thanks to the Austrian cultural forum and the Vienna city hall, the Kiev operetta is welcoming all lovers of exquisite classical music and invites you to New year's concert “Strauss in the operetta”. How else, after all, the most important holiday of the year everyone have to receive gifts! The troupe of musical theatre will award a collective creative gift to the people of Kiev just from the stage. Music by the illustrious kings of the waltz, two generations of the Strauss family, will sound the entire evening from the orchestra and leading soloists vocalists. However, a real Viennese ball is first and foremost a dance! Special guests of the festive evening, artists from the Studio of ancient dance "La Rêverie", will demonstrate their art to the audience. So put on your best clothes, take hand in hand your loved one and come to romantic new year's eve concert!